Tuk tuk vs Walking- What's the best way to experience unique Bangkok? It’s an age old question- What’s the best way to see a different side of a new city? To get off the beaten path and really connect with the locals. To be able to come home and brag that you’ve have had a truly unique experience and that everyone you know should also go and have this totally unique experience. Exploring cities old and new is one of my favourite parts of traveling. I love to walk around and experience the good, the bad and the ugly side of a city. I always tell myself, afterwards, that getting lost is half the fun and a great way to discover new and interesting places or people. 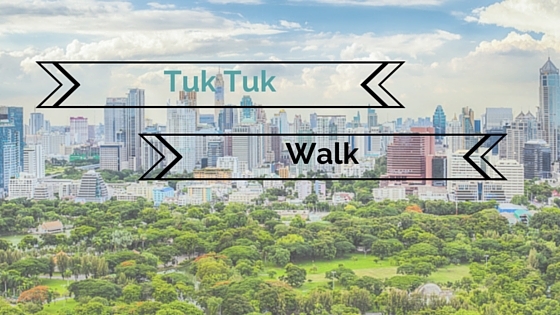 With only a week in Bangkok and TBEX slammed right in the middle of my stay I was torn- Do I tuk tuk or walk it out? I needed to find a way to really discover my true feelings for this great ol’ big city. It is no secret what so ever that I absolutely hated Bangkok the when I visited in March 2014. A combination of teenage sulky events happened during our visit. Political unrest, bombings, half the city was shut off to foreigners. The usual Thai style scams where even more insistent. According to tuktuk drivers every major monument in the entire city was “shut”. Taxi drivers were tripling prices and that’s if you could convince them to take you for a ride. I’m sure you get it. It wasn’t great as you can see in the photo below. Along comes Expique tours who are on an mission to help you EXPerience unIQUW with a variety of walking and tuk-tuk adventures. 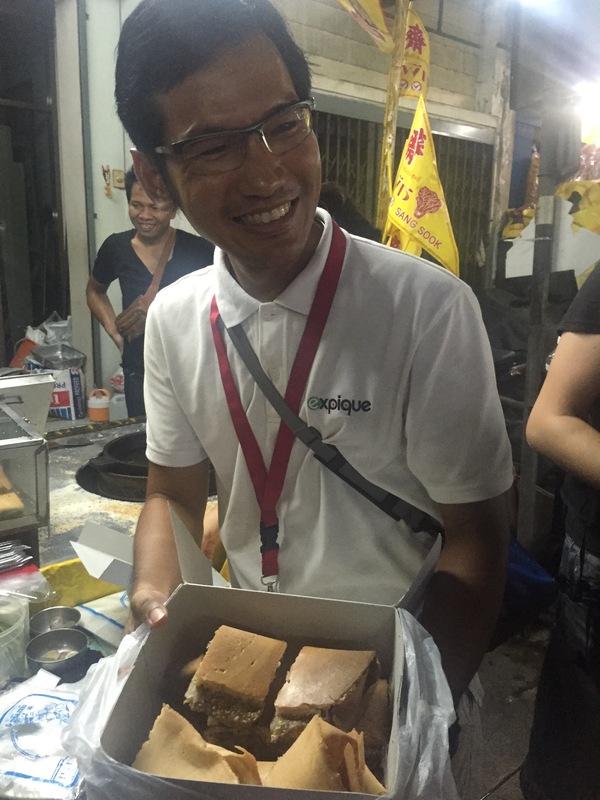 Expique Is on a mission to develop a range of unique travel experiences in Bangkok and beyond. We believe travellers are increasingly looking for something different and we are looking to provide them with some great options. Some people are looking to meet more locals, others to get off the beaten track, and some simply to see t e main tourist sites but from a different perspective. At Expique we are developing experiences that achieve this. We believe a tour should be more than just a tour, but a complete experience! I was lucky enough to join fellow TBEX attendees on not one but two Expique tours- TukTuk night adventure and Diversity & Harmony Walking Tour. *Note that this particular tour was a special edition which coincided with the Vegetarian Festival. Taking a tuk tuk really is a must do in Bangkok. The Thai government is now limiting the amount of tuk tuk permits each year, which sadly has seen a decline in the number of tuk tuks around town. Our small group meet at the QSNC and travelled by subway along with our Expique guide Natt. Traffic is still a major issue in Bangkok, even when your in a tuk tuk. The train travel made it so much easier to meet up with our gaggle of tuk tuk drivers and avoid being stuck in Bangkok peak hour traffic and wasting precious tour time. Our first stop was China Town and taking in all that the Vegetarian Festival has to offer. The story goes that a roaming Chinese theatre company contracted a mysterious illness while touring Phuket. To combat the illness they followed strict vegetarian diet and eventually recovered. This interested the local people and as a result the festival began, during which time people keep a strict “je” diet with the aim to bring good luck to individual as well as to the community. From then on this festival was observed starting the first evening of the ninth lunar month and continuing until the ninth evening. The first thing which really stood out was the inundation of yellow flags around the stalls. The yellow flags are a simple and easy way for the shops to declare that they are ‘je’ for the duration of the festival. As we walk around our guide Natt stops at stalls as fills us in on the delicious snacks on offer. After smoking ourselves out it’s time to pop back in the tuk tuk, blow away the smoke and off the to experience the calm before the storm of the Flower Market. 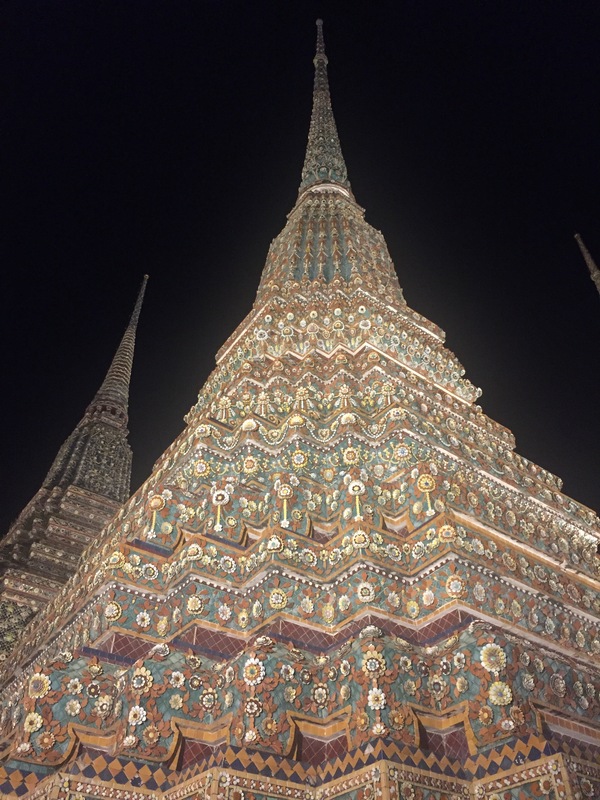 By far the highlight of this tour is walking around Wat Pho at night. When we arrive there’s not another person to be seen and the silence is deafening. At the back of my mind I know that I’m in a busy, bustling city. Yet as soon as you walk in all that white noise seems to stop. With ease you can glide around the complex and take Now you can’t get inside any of the temple buildings or walk alongside the Reclining Buddha. 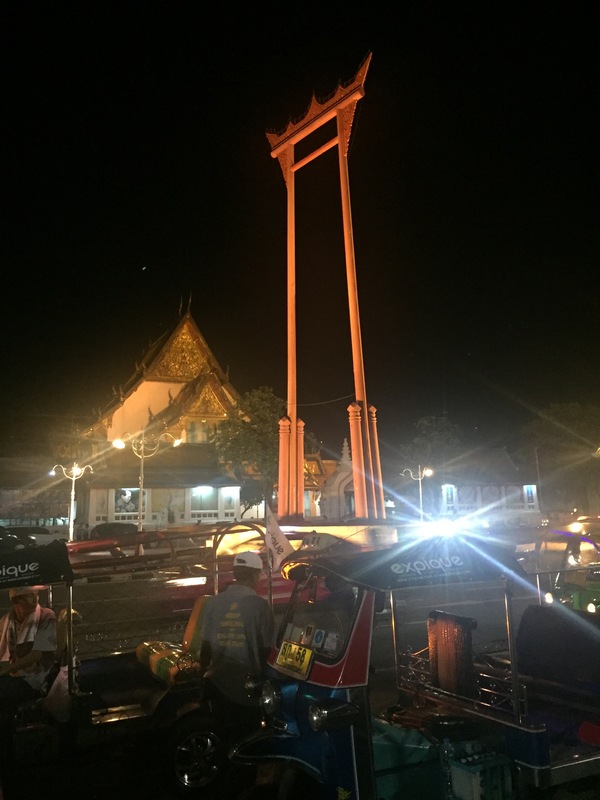 One of the great stops is a visit to The Giant Swing standing out the front of Wat Suthat. 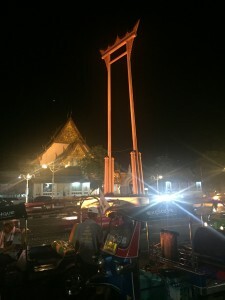 Standing at 21.15 metres, between Wat Suthat and Bangkok City Hall, the Giant Swing’s two towering red pillars and elaborately carved crossbar are unmistakable from afar. After undergoing several renovations, the original Giant Swing, dating from 1784, was replaced in 2004 with a new one crafted entirely from golden teak. We also where lucky enough to have our guides P and Natt educate us on Krung Thep Mahanakhon Amon Rattanakosin Mahinthara Ayuthaya Mahadilok Phop Noppharat Ratchathani Burirom Udomratchaniwet Mahasathan Amon Piman Awatan Sathit Sakkathattiya Witsanukam Prasit. The tuk tuk drivers are really lovely. 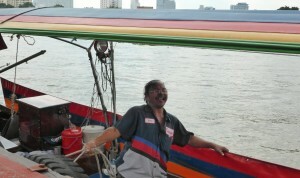 Happily and safely zipping along the streets of Bangkok. Being at night there was no worry about being caught behind a plume of diesel from one of Bangkok’s infamous public buses. 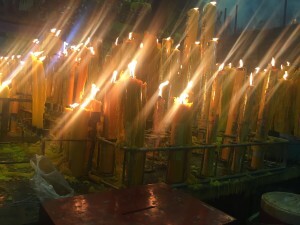 The tour does incorporate a fair amount of soft strolling through markets and temples. Includes– snacks, dinner and a dedicated tuk tuk driver. People associate Bangkok and Thailand with Buddhism, yet it is city where many cultures live in harmony alongside each other. This tour visits a stretch of the riverbank in the Klong San and Kudeejeen communities on the Thonburi side where many original communities remain and passes by Thai temples, Chinese shrines, churches and mosques. Yet, this is not a tour about religion, but rather one where we explore the diverse local cultures and the stories of how these groups arrived in the area. Along the way you will we pick up some local snacks.- Expique website. I’m going to be really honest- This walking tour was my favourite activity while I was in Bangkok, only trumped by drinking fresh pomegranate juice. It was a perfect combination of history, religious interaction (visiting temples/churches and a mosque!) and snack time. Did you know that Bangkok has a world famous Portuguese bakery? The walking part is really easy. After a quick boat ride across the river it’s all fairly flat and cruisy. I was being lazy and walked in my flip flops without an issue. This tour takes you on an urban adventure through a combination of small backstreets and riverside paths. You really do get a glimpse into the variety of life of the Bangkok residents. I really don’t want to go into the nitty gritty of how fabulous this tour was, as I want you to go and experience yourself! Finally we arrive at the famous Wat Kalayanamit before heading back across the river where the tour will finish near the flower market. 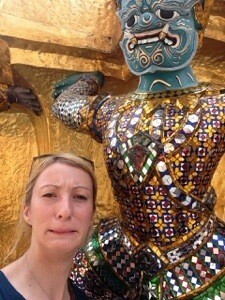 Walking in an area of Bangkok where the people are genuinely friendly and surprised to see foreigners. At least twice I was asked if I was lost and needed directions. This guy happily took of his shirt to show us his old school gangster tattoos. A much needed break in the Princess Mother’s Memorial Park. Portuguese Catholic community famous for it’s desserts. Snack time: You can’t come to Bangkok and not eat street food. This tour offers some of the greatest street food snacks I’ve ever had in Thailand. Despite Expique’s owner Simon trying to convince me time and time again that these are not foodie tours, as a foodie these where some of the tastiest tours I’ve been on in a long time. There’s a great balance of snack time, cultural awareness and general laughter. I’d heavily suggest that you don’t eat before joining an Expique tour. Expique tours were generous enough to offer TBEX attendees complimentary tours on several of their tours. This post is not sponsored and all views as per usual are my own. The links included along the way are not apart of any affiliate program. What a great idea by Expique tours, a tuk tuk tour of Bangkok at night. As night is the coolest part of the day there couldn’t be a better time. Wat Pho sounds to be a totally different experience at night, peace in the city! The Vegetarian Festival in Chinatown is something I’ve never heard about, or the Je diet. The walking tour looks interesting too, with the friendly locals, there must be some wonderful photography opportunities during both these tours.